Shakey Vick got into blues in the late fifties and early sixties in various duos and blues bands around London. In 1963 he formed his first band, teaming up with Chris Youlden. They won a heat of an R&B contest and did a gig at the Marquee, which was recorded by Giorgio Gomulsky of Yardbirds connection. Shakey and Chris did a few duo gigs and also worked occasionally with Dave Peverett in Dave’s band Lonesome Jax. 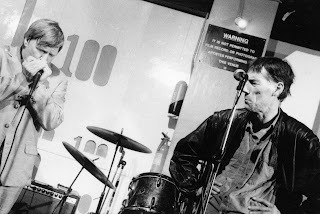 In 1967 The first Shakey Vick Big City Blues Band was formed and started to gig around London and the home-counties circuit, including the Marquee, 100 Club, Klooks Kleek, etc. During those early years he worked with many American artists, including the late Champion Jack Dupree, Arthur Big Boy Crudup, and Johnny Shines. At about this time Shakey was asked to join Savoy Brown when their harp player left. Shakey had to turn the offer down because Harry Simmonds, the manager could only offer half of what Shakey needed to live on. While the others in the band were all single at that time, Shakey had a wife and children to support. He did a few gigs until Savoy Brown had a day off and were able to rehearse their set without harp and then carried on with his own Big City Blues Band. Later both Chris Youlden and Dave Peverett joined Savoy Brown and started their States careers. The Shakey Vick band gigged regularly for a few years before Mel Wright, Ron Skinner and Rod Price split to form Dynaflow Blues. Rod Later teamed up with Dave Peverett in Foghat, the British band which became very successful in the USA. The Shakey Vick band continued with Bruce Langsman on guitar and the first album Little Woman You’re So Sweet, was recorded for Pye in 1969 (later released in the U.S.A. on the Janus label, a Chess Records-associated company). This was followed by the first continental touring. Shakey Vick Tours in Europe included: Denmark and Sweden in 1969/70, Holland 1972, Holland/Belgium 1974, Holland 1981, Italy 1983, and Holland again in 1985 In 1975 Big Bear Records asked Shakey to be the Artistes road Manager for the annual Anglo-American tour of France, Holland, Belgium, Switzerland and Germany. Here he travelled with Homesick James, Billy Boy Arnold and Tommy Tucker among others. One night arriving late at a German hotel, Tommy asked to share Shakeys room as hed got fed up rooming with Homesick. The next morning, the musicians asked Tommy what it was like sharing the room with a white guy. I slept with one eye open. declared Tommy. I slept with both eyes open. Shakey replied. A series of long-lasting residencies on the London circuit continued during the ups and downs of the blues scene in Britain. Shakey continued to play the blues when other bands were turning to Rock, indeed his whole career has been about encouraging interest in the blues, whether as a musician inspiring younger blues players via open mic jams, or as the editor of a blues magazine, British Blues Review, or as a promoter of blues gigs around London. Shakey edited the British Blues Review from April 1998 until July 1999. In addition to his band work, Shakeys promotions around London from 1992-1999 included the American artists, Kenny Neal, Lucky Evans (ex Howlin’ Wolf), Guitar Shorty, Elisha Blue and U.P.Wilson. at places as diverse as the 100 Club W1, the Carnarvon castle NW1, the Station Tavern W10, the Plough SW17 and the Dublin Castle NW1. He also started his own blues label, Vicksboro Records. In January 2000, he went to the U.S. to gig and record an album for ex -Foghat guitarist Rod Price. Rod was in the first Shakey Vick band before joining the Black Cat Bones and then going on to success in the States with Foghat. The cd was released in the U.S on the Burnside label and then in Europe about eight weeks later. Shakey returned to the States another four times during the following eighteen months for promotional tours. Currently Shakey has teamed up with Chris Youlden and Mel Wright (Chris was the singer in Savoy Brown when that band started to take off in the States, but he had formed a band with Shakey as early as 1963. Mel was the drummer in the original Shakey Vick Big City Blues Band). They have formed a new band, Maxwell Street, named after the famous Chicago market where bluesmen and women busked on the street. The band personnel are Shakey Vick, vocals and harp, Chris Youlden, vocals and guitar, Bernie Pallo, lead guitar, Pete Moody, electric Bass and Mel Wright, drums. They have recorded a 4-track cd entitled Movin Along with all songs penned By Shakey and arranged by the band. This has now been released on the Vicksboro label. The band will be doing some gigs in future. The Shakey Vick Big-City Blues Band will also continue to gig. Maxwell Street have changed their name as there are at least two other bands with the same name. The band will now be known as Waydown and will release the forthcoming Cd album under the title “Greek Street” after the Soho street. This album will consist of nine new tracks plus the Maxwell Street tracks. The band meet in the Coach & Horses pub in Greek Street, whenever they need to discuss business. This is the pub where Mel and Shakey first came up with the idea of the Moving Along Cd, and also where the name change was agreed so it seems appropriate to identify with the area. Waydown’s line-up is the same as Maxwell Street with the exception of the bass. Pete Moody was unable to continue due to other commitments so Andy Cleveland joined for the other recording sessions. Andy has worked with the Shakey Vick Band and with Gordon Smith and the Top Topham/Jim McCarty Band among others.